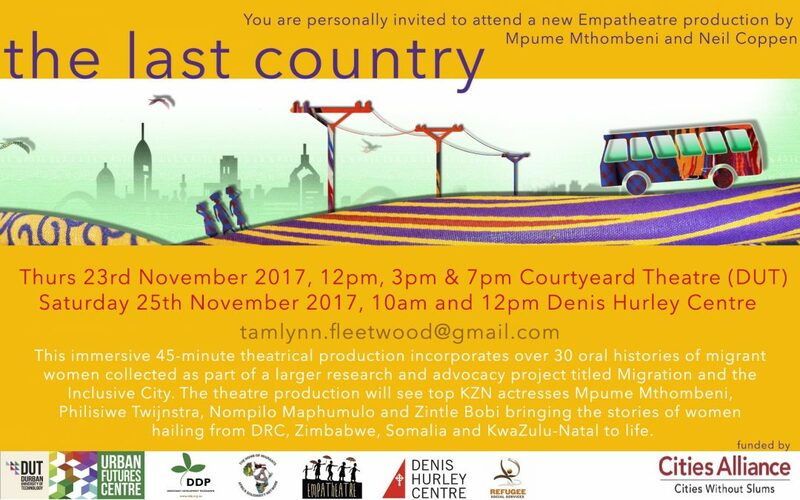 We are excited to announce our upcoming theatre production by award-winning Durban theatre-makers Mpume Mthombeni and Neil Coppen (part of the Empatheatre team responsible for UlWEMBU, which looked at street-level drug addiction in the city of Durban). The pair have created an immersive 50-minute theatrical production which incorporates over 30 oral histories collected as part of a larger Urban Future Centre, Democracy Development Programme and ASONET’s research and advocacy project titled Migration and the Inclusive City (funded by the Cities Alliance). 23rd November 2017, 12pm, 3pm and 7pm at the DUT Courtyard Theatre (Ritson Campus). Each production on this day will be followed by a lively discussion on the emerging themes. Refreshments will be provided. 25th November 2017, 10am and 12pm at the Denis Hurley Centre – safe parking behind Emmanuel Cathedral or below Victoria Street Market. Each performance is limited to 35 seats, so please RSVP to Tamlynn Fleetwood on tamlynn.fleetwood@gmail.com as soon as possible to avoid disappointment, and please specify which performance you would like to attend. Through focusing on the everyday experiences of migrant women in the city of Durban, the project aims to develop a participatory city-led policy framework around migration, and it sets out to challenge problematic stereotypes around migration in the city.